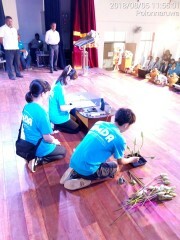 Kazuko Taketani, AMDA Volunteer Center Chief This year's program was held from 3 to 5 August in Polonnaruwa, Sri Lanka. On the 4th, the second day of the program, His Excellency Maithripala Sirisena, the President of Sri Lanka, walked onto the grounds of the Royal Central College. We were able to meet His Excellency, who observed our program and even took a commemorative photograph with us. Meeting His Excellency was upon AMDA's request and will remain a wonderful life-long memory. On 7 August, our last day in Sri Lanka, we visited Chandrika Bandaranaike Kumaratunga, Chairperson of The Office for National Unity and Reconciliation (ONUR) and former President of Sri Lanka. We had a meeting with the ONUR committee, and after introductions and speeches by Mr. Tomozane, the Mayor of Akaiwa City in Okayama Prefecture, Japan, and Dr. Suganami, the President of AMDA, we were shown a video introducing ONUR’s activities. Then, the students explained and gave their impressions about this year’s peace program. 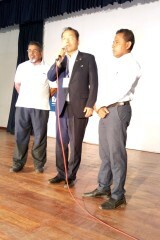 Next, as the main aim of this meeting, we delivered a message of peace from the governor of Hiroshima Prefecture to M.S.Jayasinghe, the Director General of ONUR. Following this, the two participating students from Fukuyama Seishikan High School in Hiroshima Prefecture read the letter aloud on the mayor’s behalf, moving everyone in the room. Finally, ONUR proposed signing a MoU (memorandum of understanding) with AMDA. The participation of Mr. Tomozane, the Mayor of Akaiwa City in Okayama Prefecture, is an additional distinguishing characteristic of this year’s program. Akaiwa City signed a MoU with AMDA in 2016 and, as a part of the ‘AMDA Akaiwa City Junior High School Overseas Study Program’, the city sent five of its junior high school students on this year’s AMDA Peace Building Programme. 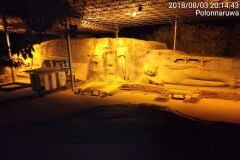 Mr. Tomozane arrived at Polonnaruwa on 4 August to observe the program and check out the location. On the morning of 5 August, Mr. Tomozane received a warm welcome from the mayor of Polonnaruwa and its people, and a deep friendship quickly sprouted between Polonnaruwa and Akaiwa City. Polonnaruwa, where the program took place this year, is located roughly 230km from Colombo, in the north-east part of Sri Lanka. Roughly 1,000 years ago, Polonnaruwa was the second capital city of the Anuradhapura Kingdom and contains a huge number of remains that are registered as world heritage sites. It is also a Buddhist city representative of south Asia. 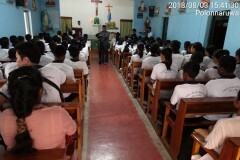 The three-day program took place at the Royal Central College, Polonnaruwa. 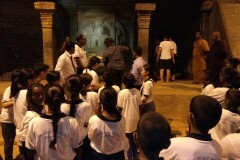 From Sri Lanka, students from various places (Kilinochchi, Matale, Muttur, Polonnaruwa) accompanied by their teachers, and from Japan, students from AMDA Students Club; junior high school students from Akaiwa City; students from Seishikan High School in Fukushima, Hiroshima Prefecture; and the mayor of Akaiwa City, Takenori Tomozane (from 5 August), with three of his staff all participated in this year’s program. 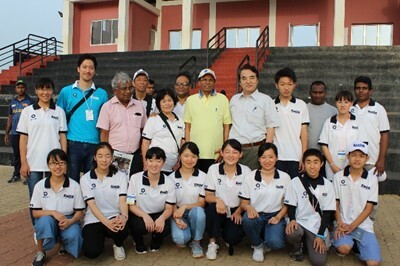 The three groups from Japan joined as one team under the slogan ‘share our smile’, with the aim of deepening their exchange with the Sri Lankan students in the name of mutual understanding and mutual trust. The first activity of the program was the Religion Program, where all students visited the places of worship of the four religions: Buddhism, Hinduism, Islam and Christianity to learn more about each other’s religions. 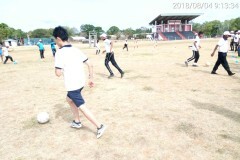 In the Sports Program, the boys through football and the girls through netball, the students deepened their exchange. In the closing ceremony, students from the various schools introduced cultural displays such as dances and other performances. The Japanese students made good displays of Japanese culture with Japanese calligraphy and ‘ikebana’ (Japanese flower-arrangement). 1) Every student drew a picture showing their own idea of 'peace'. Then, a representative of each group explained everyone's pictures to the other groups. 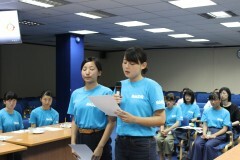 2)The Japanese students gave a presentation about their ideas of 'peace'. The junior high school students from Akaiwa City introduced Japanese events and food, etc. ; the Fukushima Seishikan High School students explained Hiroshima's role in terms of 'peace'; and the AMDA Students Club spoke about its future plans for 'peace'. 3)As one of the major activities of this year's Peace Building Programme, the students made posters to be placed by the city's reservoir. As there are a large number of deaths associated with the reservoir every year, the posters included various pictures and messages (in Singhalese, Tamil and English) with the aim of preventing further incidents. 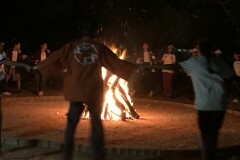 On the evening of the second day of the program, the students made a campfire together. The Japanese students led the ‘Uraja dance’, a traditional festival song and dance from Okayama. The entire group stayed up late that night doing other dances such as breakdancing and deepened their friendship even more. 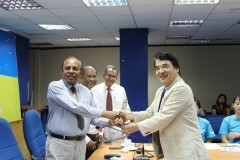 After the three-day program ended, the Japanese group returned to Colombo on 6 August to visit the Japanese Embassy in Sri Lanka. After taking a commemorative photo, while Mr. Tomozane and Dr. Suganami met with Councillor Yano in a separate room, the students gave their reports and thoughts about this year’s program and a research specialist from the embassy, Mr. Maegawa, spoke about peace building in the country. 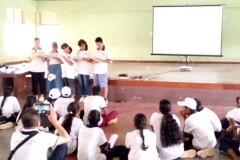 This year's program consisted of a huge total of 140 participants, including 100 Sri Lankan students (24 each from Kilinochchi, Matale and Muttur, and 28 from Polonnaruwa), 11 Japanese students, and other supervisors and staff. Mutual understanding and the knowledge of other cultures deepened significantly for all involved, particularly the children, in this Peace Building Programme. It is also good that the children were able to share their thoughts about peace. There were some very striking words among the Japanese students’ impressions of the program. “I held hands with students of different ethnic groups, Singhalese and Tamil; we all smiled, talked and became friends.”, one student said, with a gleaming smile on her face. It is sure that all of the participating students realised their roles within this program, and that learning more about peace will help them all grow. AMDA hopes that this experience will lead to all of the students having a more international viewpoint as they continue with their lives.